« From $349,900! Exciting New ADDITION Vancouver Condo Tower Previewing Now! 1 to 3 Bedroom Floor Plans Available! A luxury condo tower is coming to the cosmopolitan and trendy Yaletown Vancouver Downtown district. The Charleson by Onni is a brand new luxury high-rise at Richards and Pacific in Yaletown Vancouver. Presales are expected to launch in late Spring 2014! Your home at The Charleson Vancouver condos is just steps away from the water and the beautiful seawall. The central locale is also very convenient when it comes to access to urban green spaces, parks like David Lam Park and George Wainborn Park as well as the vibrant False Creek district. Not only that, but new home owners at The Charleson Vancouver will be within close walking distance to the Canada SkyTrain Line and to all 3 bridges including Cambie, Granville and Burrard to get to major thoroughfares. Shopping and groceries are also seconds away and this includes Urban Fare, Granville Island and Choices Market. The Yaletown high-rise will command a central location in a unique position in this trendy neighbourhood. Forever changing the Yaletown skyline, The Charleson by Onni will rise forty three storeys and will be unique and distinct in terms of design and architecture. The sleek glass and steel façade will feature only a limited number of exclusive homes that are extra spacious and luxurious. The Yaletown Vancouver Charleson condos start from over 1,000 square feet (interior living space), so there is no comparison in the downtown neighbourhood. As well, the building is designed and built by one of the leading developers in town, Onni. This is a luxury development in one of the best neighbourhoods, so don’t miss out on this incredible opportunity to own a new Yaletown condo! The 43 storey landmark tower is designed by award winning firm DIALOG with a certified LEED Gold standard! In addition, the Yaletown Charleson Vancouver luxury condo tower will feature open air balconies, high efficiency heating and cooling as well as a 24 hour concierge. All homes come with private 2 car garages as well as double glazed low-E windows. The Charleson condos in Vancouver will feature luxurious suites with one of two palettes (Scheme A = David and Scheme B = George). The living, dining and kitchen areas will have premium wide plank engineered oak hardwood floors and laundry closets have porcelain tiled floors. The bedrooms have one hundred per cent wool berber carpeting with great underlay and all closets have organizers. All homes at the luxury Vancouver Charleson Yaletown condos will feature Whirlpool Energy Star rated full sized high efficiency front loading stacked or side by side washer and dryer in addition to slim-lined roller shades (some are motorized!). There’s also Control4 automated lighting in the living rooms and sound control with built in speakers in the kitchen. The Designer Ensuites will feature NuHeat electric floor heating system and WaterSense Certified Kohler polished chrome rain shower, hand shower and faucets. As well, The Charleson Yaletown condos will feature generously sized floating wood cabinets with walnut veneer face, polished marble stone counters and under mount wash basin. There’s an oversized mirror with recessed medicine cabinet (excluding one bedroom floor plans) in addition to a linear style soaker tub surrounded by polished marble tiles. The other bathrooms will also have high-end finishes. The Charleson Vancouver condos in Yaletown will also feature top of the line appliances for the kitchen that includes Sub-Zero 36” fridge/freezer (wood panel integrated) as well as a Wolf 36” or 30” gas cooktop with five or four dual stacked seal burners. There’s also a Faber 36” or 30” brush aluminum sleek slide out range hood and Wolf 30” all stainless single wall oven with touch control panel and dual convection. The luxury Yaletown Charleson Vancouver condos will also feature an Asko 24” full sized wood paneled integrated dishwasher with 9 wash cycles and Panasonic microwave. Also, there is a Sub-Zero 24” under counter wood paneled integrated wine fridge with 46 bottle capacity. There’s marble or composite stone counters with matching backsplashes and The Charleson Vancouver luxury condos will also feature European inspired custom flat panel walnut veneer cabinetry featuring wood gables. Modern pulls are standard as are soft closing mechanisms for all doors and drawers. The luxury Yaletown Charleson Condos will also feature a stainless steel under mount offset double bowl sink with in sink waste disposal and a chopping blog in addition to under cabinet lighting. PROJECT OF THE YEAR CANDIDATE! A 43 storey landmark tower is coming soon to the heart of Yaletown Vancouver! 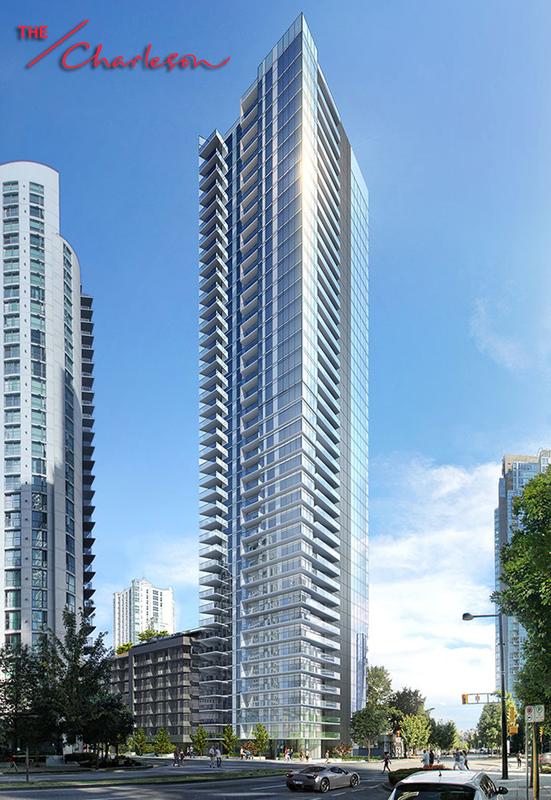 Brought to you by Onni, The Charleson Vancouver condo tower will be located at 1396 Richards Street Vancouver (at Pacific Avenue). The presale Yaletown Charleson homes will include a limited collection of customizable residences that range in size between 1,000 to over 3,500 square feet, giving prospective homebuyers a very unique presale condo homebuying experience. The Charleson Vancouver Yaletown condos are just steps away from the beautiful waterfront, Seawall and all of the best restaurants, coffee shops, boutiques, eateries, entertainment, parks and services in the Yaletown district. Uncompromised Living! Onni presents The Charleson Yaletown condos, a limited collection of spacious homes ranging from 1,000 to 3,500 sq.ft. coming soon to the corner of Richards and Pacific in Yaletown. Located in Downtown Vancouver’s most cosmopolitan neighbourhood, The Charleson Yaletown condos is a block from the Seawall, George Wainborn and David Lam Parks, numerous award-winning restaurants and nearby shops. This exclusive 43-storey landmark Vancouver condo tower features just 125 homes and was designed especially for homeowners, with a sophisticated eye for style and detail, seeking more space and privacy. Onni will be unveiling the Yaletown Vancouver Charleson Presentation Centre soon and look forward to sharing more details with you then. In advance of our opening Onni is releasing for the first time the views homeowners will enjoy from The Charleson Vancouver.